Kaori has a home! 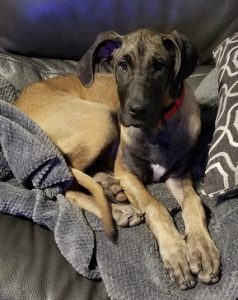 - Rocky Mountain Great Dane Rescue, Inc.
Kaori has a home with her new family McKinsie, Zach, and their 4 children, in Parker, CO! Kaori will be the family’s first Great Dane, but they are no strangers to Giant Breeds, having owned a St. Bernard for 13 years. Kaori will have some pretty big dogs to pal around with in her new home. Max, who is their very large Chocolate Lab is a real sweetheart, and his best friend is a Great Dane named Charlie, whom they dog sit for when his family is on vacation. Kaori will also have 3 human brothers; Izac, Jack, & Seely, as well as a sister named Dannie, to take her for walks around their neighborhood, and play with in the back yard. Kaori will never be short on love and play time with this family! Way to go sweet girl!